These qualities make it possible for us to share the profound wisdom of the Enneagram, so that all of us can live with more personal clarity, fewer limitations, and greater joy. is about self-knowledge – about exploring who you really are and using the Enneagram as a map for that exploration. We facilitate personal development through seminars, retreats, and mentoring sessions. We meet with clients from many professions and life situations. Our approach is informed by the literal meaning of EDUCATE—to draw out from within. We find that each one’s discovery of his or her essential gifts and primary point of view enriches life and relationships, both private and professional. We are longtime friends who call each other to “more.” We say YES to what is life-expanding and life-enhancing, and we experience these qualities in the Enneagram. 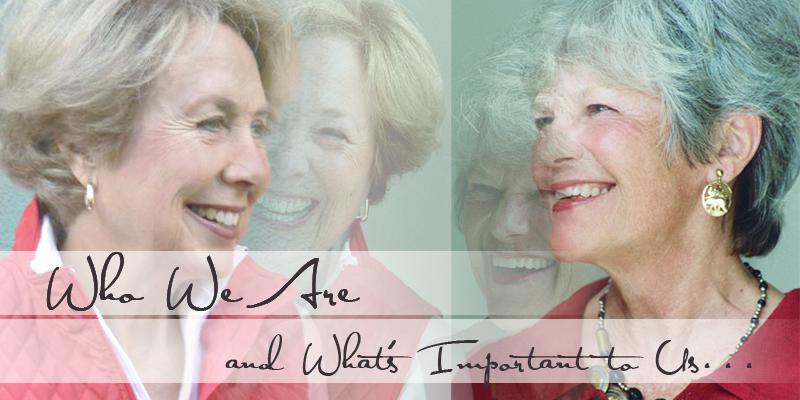 We are passionate about sharing the Enneagram because we know its value. We find ongoing verification of the Enneagram patterns, not only in the books that have “told us so,” but also rooted in our own experience. We invite others to share the wisdom of the Enneagram through information, inquiry, and personal experience. It is important to us to welcome change, to be present in the Now, and to measure our lives by degrees of expansion, freedom, and joy. We intend to have a joyful time exploring the Enneagram. We delight in the “Wow!” moments when the essential Self of any one of us manifests and our love of life is re-ignited! Our early environment profoundly impacts our lives. Mine began with strong-willed parents and three older, equally strong-willed brothers. It was soon apparent to me that in order to make my way, I had to go about the business of discovering what made us all tick. That translated into my life as a willingness to stay open and to nurture a deep desire to understand myself, others, and our evolving world. In my career as a high school teacher, I looked forward daily to classrooms of wiggling, challenging, and delightful young people. They spawned countless insights, most notably the value of finding and cherishing our individual, authentic voices. For seventeen years, following my high school teaching, I assisted my husband in starting and running a small business in which we published two monthly newsletters for the computer industry. During this period, Judy Cardoza introduced me to the Enneagram. Eureka! This system of knowledge was what I had been looking for — a Rosetta stone to not only aid in the quest to understand myself but also to understand all my relationships, most notably that of my husband, son, and daughter. I finally “got it.” They see the world quite differently from me, and expecting them to see it as I do is as absurd as expecting elephants to fly. Whew, what a relief for them and for me to let go of all that! Because of my appreciation of the value of this system and my desire to share this material with others, I certified in the teacher training program and the Authorized Workshop Teacher Program of Don Riso and Russ Hudson at the Enneagram Institute®. In addition I certified with Helen Palmer and David Daniels in their Enneagram Professional Training Program (EPTP), and have also enjoyed studying with many other outstanding teachers. The Enneagram continues to be an exquisite tool for my own self-discovery and self-realization — a key to finding my true self. This journey has brought me to the knowing that each day is an opportunity to participate in the miracle of life — its beauty and sacredness. It is in this celebration that I invite you to join me. Our innate temperament develops in a specific environment.The gifts of my birth environment included the steady beauty of mountains, sun and blue sky, the openness of a growing western city, and the humor and good nature of people who were keen observers and great appreciators of others. Talk around the dinner table, both philosophical and practical, always included amazement at how we all get on with our lives. So, it seems natural that my life work has been counseling with individuals, couples, and families for over four decades. Together, we explore those practical and philosophical questions and their daily applications: Who are we? What has meaning? What’s next? How do we live well? What works? Where’s the growing edge? What brings happiness? When I encountered the Enneagram in the late 1980s, it provided both a framework and language for this exploratory conversation and a guide for my personal adventures. I am a certified teacher of the Don Riso and Russ Hudson Insight Approach® to the Enneagram and an Authorized Riso-Hudson Workshop teacher. I have also certified with Kathy Hurley and Theodorre Donson in the Enneagram in the Healing Tradition and have studied with many other teachers of this system whose perspectives informed me deeply. Following a Vision Quest experience in 1991, I established explorations of the enneagram as the focus of my life as a teacher and as a way to pass along this wisdom. Born in Colorado, I was educated in Illinois, Colorado, and California. I finally “grew up” in the San Francisco Bay Area. I now live in New Mexico on the western bank of the Rio Grande River. I am married and have the pleasure of watching a grown son make his way in life. In roles as artist, entrepreneur, educator, writer, friend, world traveler, spiritual seeker, minister, yogini, dancer — who I am expands. It is a pleasure to teach only what I know and have found to be reliable and of great value. It is also a profound joy to be alive in these momentous times and to engage with others who desire to awaken to their lives.